Looking for an awesome YA book that will take you out of this world? Love sci-fi/fantasy series? Check out my guest post at Teens Wanna Know! I've recommended five fantastic stories by Christopher Golden (Prowlers), Thomas E. Sniegoski (Fallen), Scott Westerfeld (Uglies), Justine Larbalestier (How to Ditch Your Fairy), and Holly Black (The Curse Workers). These books include angels, shapeshifters, surgeries, good luck, and bad luck, among other things. If you haven't read them yet, you should. If you have read them, let me know which one you liked the best. Check out my Otherworldly YA post at Teens Wanna Know and leave a comment! So happy to see rgz co-founder Dia Calhon leading the list of notable verse novels in the Horn Book Guide. Congratulations, Dia! Eva is so deserving and sits in great company. 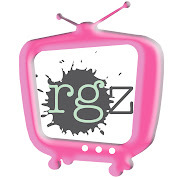 rgz Newsflash: Thank you, everyone! As we look back over the day, you all rocked the drop from Glasgow to Georgia, from zoos to restaurants, from one reader to the next, and we thank you! What a celebration for Support Teen Lit Day. You all posted, tweeted, tumbled, and pinned. The photos are awesome on #rockthedrop and the readergirlz facebook page. Be sure to scroll through and enjoy what we did together. It's AMAZING! Crissa, rgz HOST, always rocks the drop with style! Take a look at her video drop. Thank you, Crissa! Thank you, publishers, such as Team Egmont! Thank you, libraries, such as San Diego County! I am a Spanish and English teacher at Del Norte High School and a bunch of my Education In Action club kids will be dropping off books in the 4S Ranch community. Keep your eye out! We're so excited to be a part of this wonderful, literary cause. If you were not able to rock the drop yesterday due to time, weather, or other such uncontrollable things, don't fret - you can totally drop a book today, this weekend, whenever time allows! When you do, leave us a comment here at the readergirlz blog or on Facebook, and tweet @readergirlz with the hashtag #rockthedrop - and include a picture if you took one! You can also participate on a larger scale, if you'd like, by donating a bunch of books to the place or cause of your choice. Visit a local shelter, a school, a library, a children's hospital, and ask if they take donations. Once you've gotten the okay, gather up new or gently used books from your friends, family, classmates, and co-workers, add the bookplates, tuck in some bookmarks, then drop the books off! For example, you could send Ballou High books from their wish list via Powells books! That would be a cool way to tie-in both readergirlz and GuysLitWire. Here's how you can help out Ballou High: It's Time for the Annual Spring Book Fair for Ballou High School Library! During yesterday's tweets and texts, we heard about World Book Night, which is happening on April 23rd. Learn more about that, and see if an event is happening in your neck of the woods. Is this the first time you've heard of Operation Teen Book Drop? Anyone anywhere in the world may participate. It's free, it's fun, and it's global. Want to learn more about it? Click here! It's here! Celebrate Support Teen Literature Day by dropping YA titles for happy readers to find! Rock the Drop with rgz, Figment, iheartdaily, Soho Teen, and 826NYC. 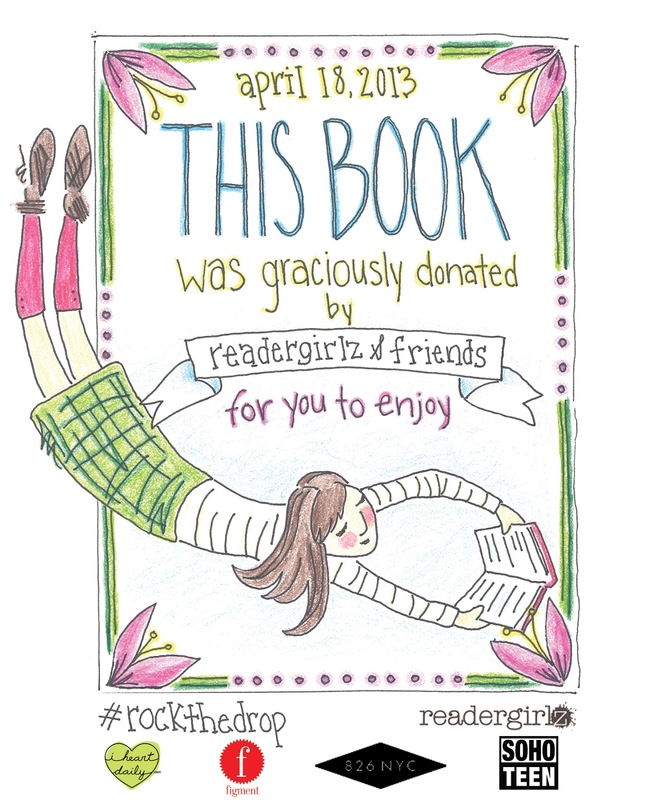 •Print out the below bookplate (by Lindsay Frantz) and drop your book in a public place. •Follow @readergirlz on twitter and tweet #rockthedrop. Post your pics at our facebook page. Ready, set, go! Rock the drop! rgz Newsflash: Figment will Rock the Drop! Word is coming in left and right for tomorrow's plans to Rock the Drop for Operation Teen Book Drop. If you are in NYC, check out the below from Figment! Figment will be manning a table outside our Upper East Side office on Thursday with a bunch of free books -- we're encouraging people to come and take two: one for keeping, one for dropping. If you could tweet this out, we'd appreciate it! Our Twitter handle is @figment. Link is below. And of course, if you want to add some books to our pile (we'll have bookplates), drop em by! Let us know where you are dropping for 2013! Full details and bookplate here! Can't wait to see your #rockthedrop tweets and pics at the rgz facebook page! Operation Teen Book Drop is coming! Are you ready to #rockthedrop? 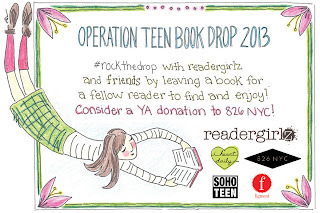 We're so excited to be rocking Operation Teen Book Drop '13! You guys know The Drop is one of our favorite days of the year -- what better way to get on board with Support Teen Literature day? This year, in addition to rocking out and dropping our favorite YA titles in public spaces for lucky readers to discover, we're also directing supporters of teen fiction everywhere to consider a book donation to 826NYC to help grow their library. On April 18th (that's next Thursday! 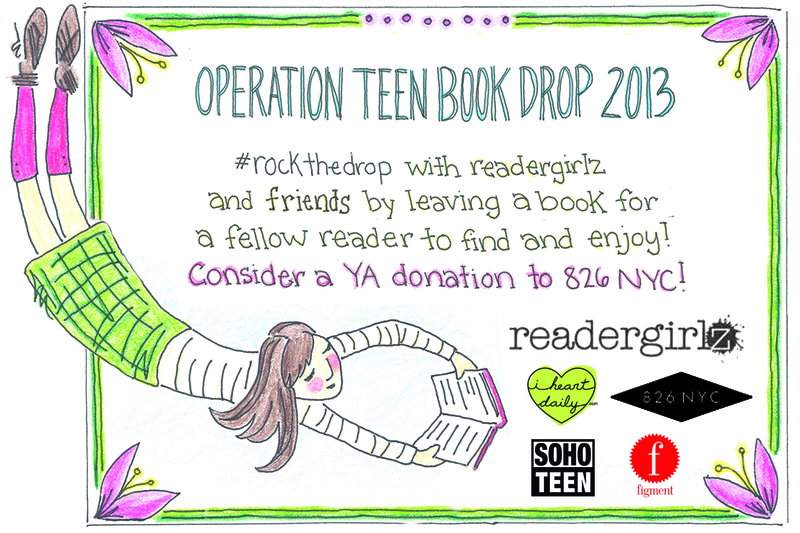 ), readergirlz will be teaming with Figment, I Heart Daily, Soho Teen, and 826NYC to celebrate YA lit. 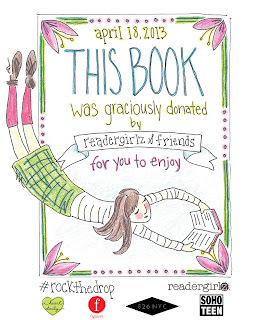 Want to #rockthedrop with us? Of course you do! Don't forget to post pics at our facebook of any books you drop or find! Hope to see you online on Support Teen Literature Day!